Amino acid sequence derived from extracellular domain of mouse TNFSF11 (BAA97257.1) (Arg 72-Asp 316) was fused with the Fc region of human IgG1 at the N-terminus. 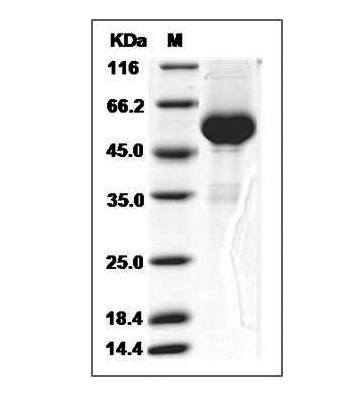 Immobilized mouse Fc-TNFSF11 at 10 μg/ml(100 μl/well) can bind biotinylated human TNFRSF11B-His. 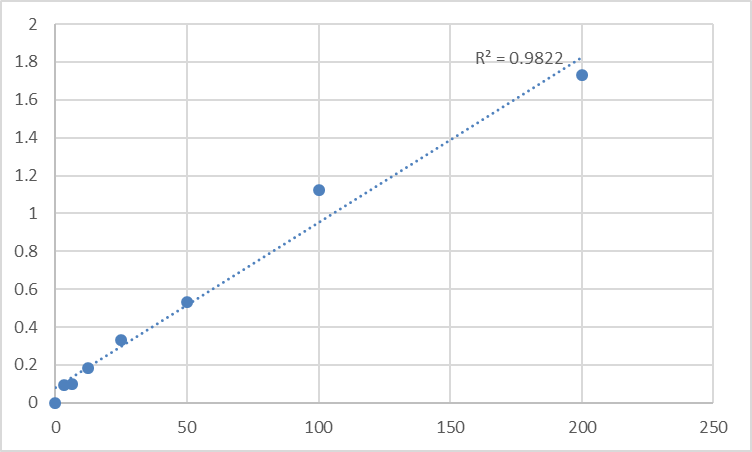 The EC50 of biotinylated human TNFRSF11B-His is 0.07-0.17 μg/ml. The recombinant mouse TNFSF11/Fc is a disulfide-linked homodimer. The reduced monomer comprises 505 amino acids and has a calculated molecular mass of 56 kDa. 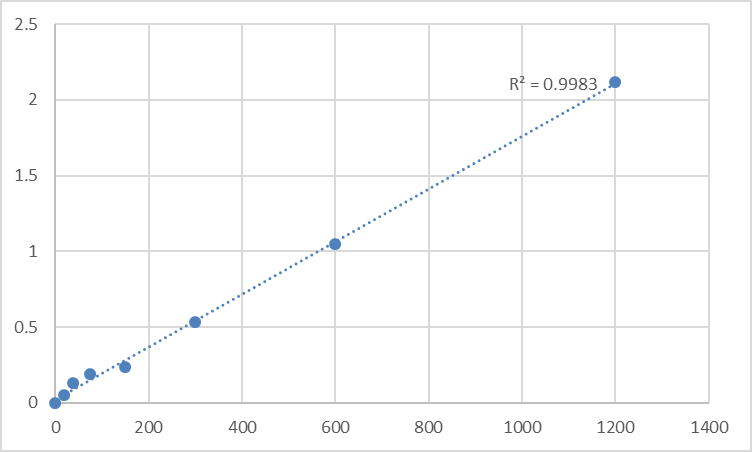 The apparent molecular mass of the monomer is approximately 50 kDa in SDS-PAGE under reducing conditions. 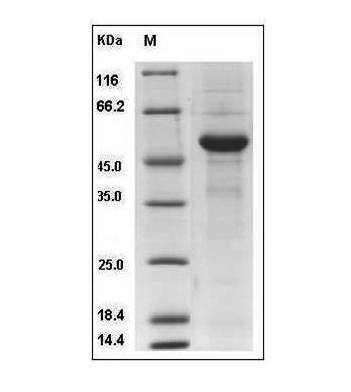 Fig.SDS-PAGE analysis of Mouse RANKL protein, Fc Tag. Always centrifuge tubes before opening. 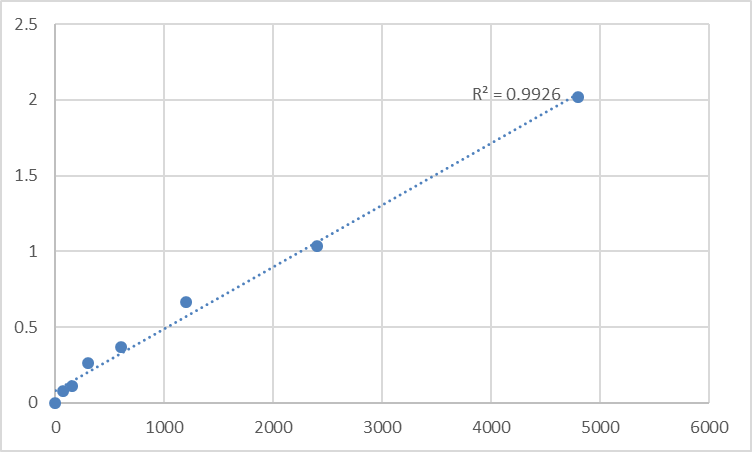 It is recommended to reconstitute the lyophilized Mouse RANKL protein, Fc Tag in sterile ddH2O not less than 100µg/ml, which can then be further diluted to other aqueous solutions. Lyophilized Mouse RANKL protein, Fc Tag product should be stored desiccated below -20°C. Upon reconstitution, the protein should be stored at 4°C between 2-7 days and for future use below -20°C. For long term storage it is recommended to add a carrier protein (0.1% HSA or BSA). Please prevent freeze-thaw cycles. 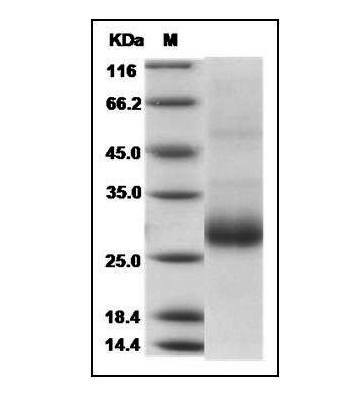 Tumor necrosis factor ligand superfamily member 11, also known as Receptor activator of nuclear factor kappa-B ligand, Osteoprotegerin ligand, TNFSF11, RANKL, TRANCE, OPGL and CD254, is a single-pass type II membrane protein which belongs to the tumor necrosis factor family. The receptor activator of nuclear factor-kappaB ligand (RANKL), its cognate receptor RANK, and its natural decoy receptor osteoprotegerin have been identified as the final effector molecules of osteoclastic bone resorption. RANK and RANKL are key regulators of bone remodeling and regulate T cell/dendritic cell communications, and lymph node formation. Moreover, RANKL and RANK are expressed in mammary gland epithelial cells and control the development of a lactating mammary gland during pregnancy. Genetically, RANKL and RANK are essential for the development and activation of osteoclasts and bone loss in response to virtually all triggers tested. Inhibition of RANKL function via the natural decoy receptor osteoprotegerin (OPG, TNFRSF11B) prevents bone loss in postmenopausal osteoporosis and cancer metastases. Importantly, RANKL appears to be the pathogenetic principle that causes bone and cartilage destruction in arthritis. RANK-RANKL signaling not only activates a variety of downstream signaling pathways required for osteoclast development, but crosstalk with other signaling pathways also fine-tunes bone homeostasis both in normal physiology and disease. In addition, RANKL and RANK have essential roles in lymph node formation, establishment of the thymic microenvironment, and development of a lactating mammary gland during pregnancy.